Hill-Rom has unveiled an airway clearance system that is integrated into a mobile vest and allows patients more freedom of movement while receiving their respiratory therapies. The Monarch provides high-frequency chest wall oscillation (HFCWO) — a standard of care for Cystic Fibrosis — and can be customized to fit patients fifteen years and older. Cystic Fibrosis (CF), which affects more than 30,000 Americans, is a genetic disorder commonly diagnosed by age two that causes a thick buildup of mucus in the lungs and other organs. If the mucus is not regularly cleared, it can cause infections and lung damage that can lead to respiratory failure. Research has demonstrated that HFCWO therapy, first introduced in the 1990s, can improve lung function and quality of life for patients with CF symptoms, bronchiectasis, or other chronic respiratory conditions. Traditional HFCWO systems use an inflatable vest that is attached to a machine, which provides mechanical physical therapy using high-frequency vibrations that loosen and thin mucus that has built up in the lungs. The external generator requires patients to remain seated in a chair during treatments. Hill-Rom’s Monarch system, in comparison, is a self-contained unit that allows the patient to go about their daily routine while receiving therapy. The Monarch system uses pulmonary oscillating discs (PODs) that thin mucus with targeted kinetic energy. The system includes a rechargeable battery and is connected through the VisiView Health Portal, first introduced last year as part of the the VisiVest System. 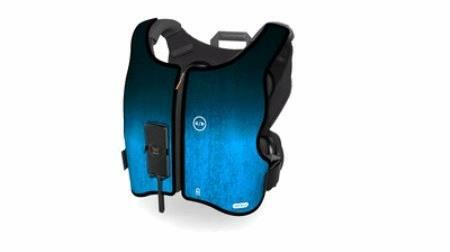 Wireless connectivity of the vests is powered by technology engineered by Qualcomm Life, and can collect therapy adherence data and reduce the risk of infection and hospitalization. Related, Hill-Rom recently completed its acquisition of patient-monitoring business Mortara for $330 million, a move expected to expand Hill-Rom’s offerings in cardiovascular diagnostics and vital sign monitoring. Mortara’s portfolio adds to the patient monitoring product offerings Hill-Rom purchased in its $2 billion acquisition of Welch Allyn in 2015.